Janna Hoehn at home in Kihei on Maui May 22, 2015. Hoehn is going through images of fallen Vietnam War soldiers sent to her by families all over the country. A web search for nearly any soldier who died in the Vietnam War, from the Pacific and a large portion of the south, can now be traced to a photo and profile in thanks to Janna Hoehn. A florist from Hawaii, Hoehn is in the midst of what has become a full-time project — amassing photographs of casualties. 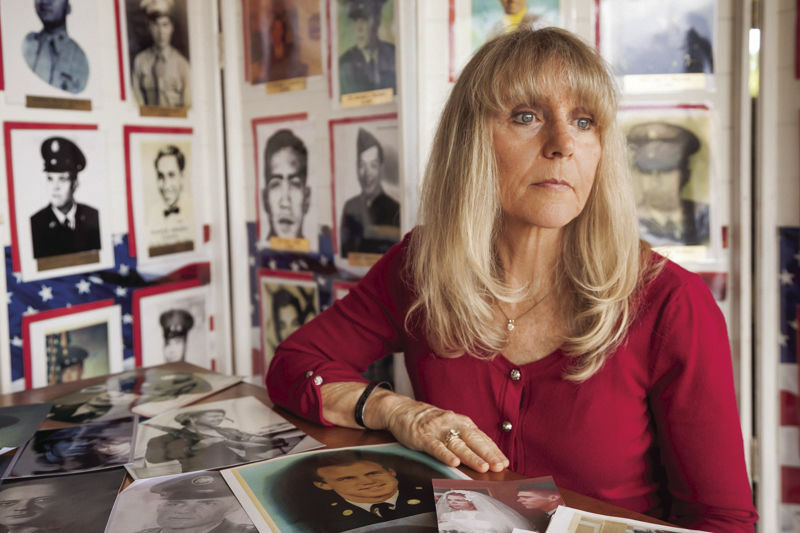 After a two-and-a-half-year search, she has finally gathered pictures from all 3,420 fallen soldiers from Texas. This endeavor is part of a nationwide campaign titled “Faces Never Forgotten,” with the aim to honor and recognize those who volunteered and were drafted in the decades-long war. This minute acknowledgement, she believed, was not enough. Hoehn was in high school about the time of the war and vividly recalled the “not pretty, disturbing” treatment those who returned received. Two of her cousins served and made it back. However, she said, one of them was not the same man upon returning and never liked to discuss his time spent overseas. For her cousins and for all families who have lost a loved one to this war, Hoehn began this venture. It began in her residing state of Hawaii and from there moved on to her home state of California, then further eastward. The photos are obtained county to county by reaching out to newspapers, libraries, high schools and any other resources available to the public. She recalled her time spent on Hidalgo County. A total of 71 young men died but 26 photos were yet to have been uncovered. There was one Edinburg veteran that she greatly struggled in matching a face to his name. Figures and information on the veterans are obtained from the Veterans Memorial Fund and the nearest drafting location is listed as the home of record, which can deter the process. “When I put my mind to doing something, I can’t be stopped,” Hoehn said. This unrelenting attitude drove her to dig further and finish. Upon contacting funeral homes in the area, she discovered the operator to be an acquaintance with the vet’s sister. And that’s how she completed county 108. Throughout her quest, she has been a guest on many TV and radio interviews, and one particularly major advancement came after she did an interview with a Fort Worth station. With the help of viewers, an additional 24 photos were recovered. The determination to honor these individuals has inspired her to devote about 40 hours a week to scouring obituaries, yearbooks, etc. Hoehn is also aware of the varying time zones, as she lives in the Aleutian time zone, which is several hours behind most states. Still, she treats this passion project as a total commitment and is happy to awaken before the tropical sunrise to place her calls to collect just one more photo. While her journey is not yet over, with another few thousand photos to go, she feels a deep gratitude for the help she’s received from the community and the families she has met along the way; she listed librarians, readers, volunteers and town folk that have helped bring in more photos. To view the photos and learn more about Faces Never Forgotten, visit the Vietnam Veterans Memorial Fund at vvmf.org/thewall. Hoehn can be directly reached at neverforgotten2014@gmail.com.